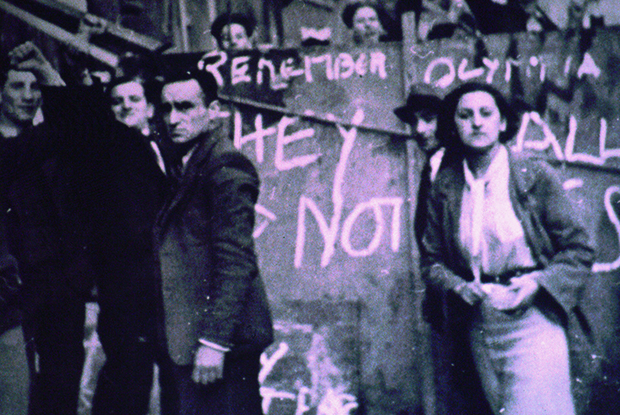 Eighty years ago, on 4 October 1936, thousands of East Londoners stood together to oppose fascists who wanted to march through the then predominantly Jewish neighbourhood of Stepney. 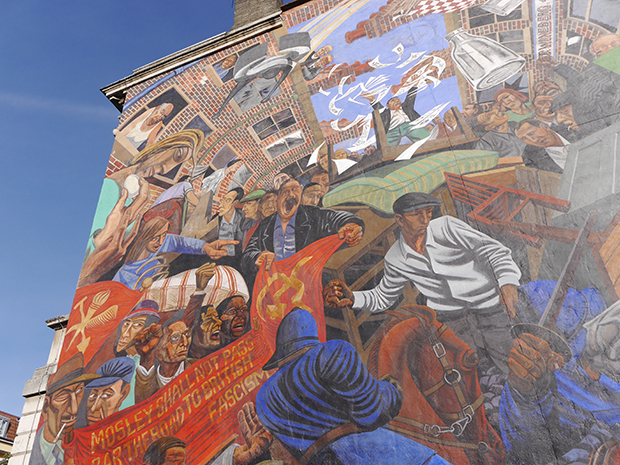 The Battle of Cable Street, as it became known, is now regarded as a defining moment in East London’s history. To mark its 80th anniversary this month residents and local organisations will be holding a series of commemorative events. The Tower Hamlets’ Grand Union Orchestra is hosting a week of concerts aiming to encapsulate the mood and memory of the Battle of Cable Street and explore the influence it has today – particularly on those communities still facing racial prejudice. “Our intention is to give a voice to as many strands in the local community as possible, whether recalling the events of 1936, or recounting experiences of similar events since,” said the orchestra’s director and composer Tony Haynes. Other commemorative events include a photography exhibition at Watney Market Idea Store (part of Photomonth) and a historical walking tour of the East End led by author David Rosenberg, who will also be hosting a panel discussion about the events of October 1936 and the subsequent story of the mural depicting the battle on the wall of St George’s Town Hall in Cable Street. Then on 9 October a commemorative march will get underway in Altab Ali Park before proceeding to the Cable Street mural for a rally, where local MP Rushanara Ali and Labour leader Jeremy Corbyn are expected to speak. During the 1930s economic instability and unemployment created a climate of ideological conflict all over Europe, allowing Hitler to come to power in Germany. Britain was not immune from this climate of intolerance, with the Jewish community in Stepney becoming a target. The Blackshirts of Oswald Mosley’s British Union of Fascists party used militant tactics similar to Hitler’s Brownshirts in Nazi Germany. The party drew huge crowds at their rallies and planned to march through Stepney to mark their fourth anniversary. Nearly 100,000 East Londoners, both Jews and non-Jews, petitioned home secretary John Simon to stop the march going ahead. He refused, and instead deployed record numbers of police to secure the Blackshirts’ route. But on the day of the march, a coalition of anti-fascist protesters, Jews, dockers, Irish labourers and communists, vastly outnumbered the police and Blackshirt marchers. As many as 250,000 people are thought to have assembled to oppose the march. Barricades were set up, bricks were thrown, and women are said to have tipped the contents of their chamber pots on the police from upstairs windows. The police retreated and cancelled the march to prevent bloodshed although around 200 people were injured and many arrests made. Marie Joseph, aged 94, remembers first hand the Battle of Cable Street. “I was 14 at the time and my brother was 12 and we both went along to see what was going to unfold,” she said. “Word quickly got around that Mosley was going to march through the streets, the whole neighbourhood knew. “We saw the Blackshirts approaching and they were pelted with eggs straight away. 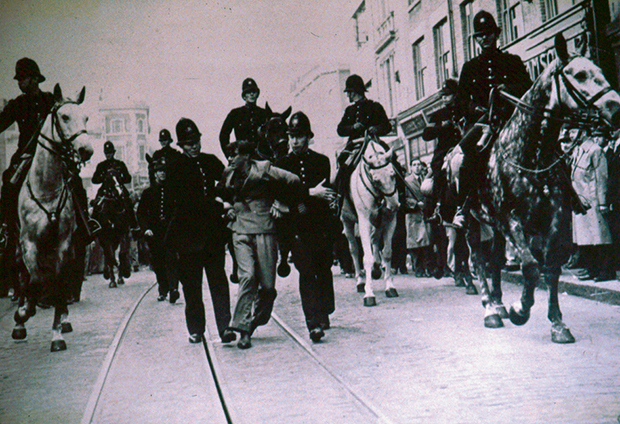 “The police and their enormous horses tried to disperse the crowds, I couldn’t see Mosley, just a line of people, but I believe he was carefully escorted away by the police. See cablestreet80.org.uk for more details of the events taking place for the 80th anniversary of the Battle of Cable Street.